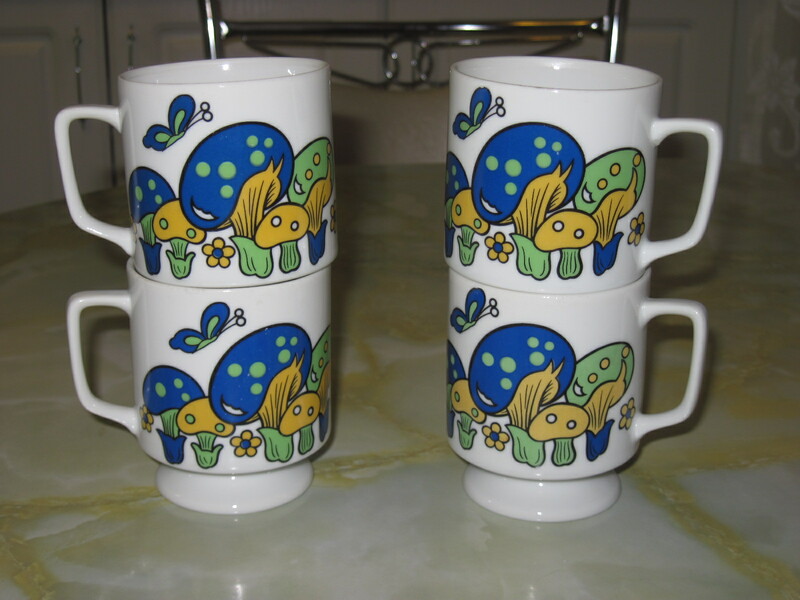 Wonderful set of 4 colourful pedestal mugs, with pattern of mushrooms in blue, green and mustard yellow. These colours, and of course the mushrooms, are indicative of the late 60’s or early 70’s. Japan manufactured a huge amount of colourful dishware for the North American market during this time period so it is still relatively easy to find and collect. Finding items in mint condition is a little harder and prices usually reflect that. These mugs are in wonderful condition and are on display and for sale at my booth at the Almonte Antique Market, 26 Mill Street, Almonte ON. Priced at $20 for the set of 4.